A Pre-Raphaelite painting of a sleeping St Cecilia was bought for a world record £6m last night by the composer Lord Lloyd-Webber. 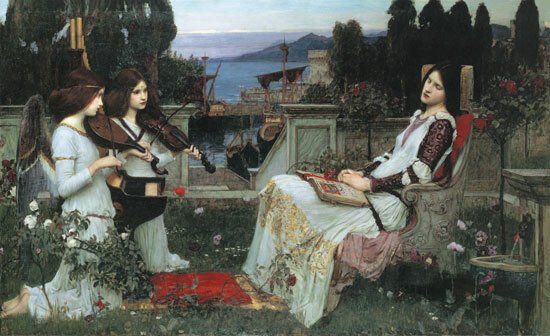 The painting, by the British artist John William Waterhouse, fetched the highest price paid at auction for a Victorian work of art. Lord Lloyd-Webber, who had wanted to buy the 1895 work for some time, paid nearly twice the pre-sale estimates for the auction at Christie's. It eclipsed the previous record for a Victorian painting held by another Pre-Raphaelite painting - Sleeping by Sir John Everett Millais - which sold for £2,091,500 at auction in June last year. The St Cecilia changed hands for £2,415 in 1913 - a huge sum at the time - and was then lost before being rediscovered in the 1960s. The painting, which depicts two youthful angel minstrels serenading the patron saint of music while she rests in a marbled chair, was last seen in public more than 30 years ago. Speaking after the auction, Lord Lloyd-Webber, 52 said: "I've collected Victorian paintings since I was a teenager, many of which I bought for tens of pounds and this Waterhouse is the best I've ever seen." At the same sale, a 1797 painting by Joshua Reynolds, The Archers, realised £1,653,750; George Stubbs's Tristram Shandy made £2,313,750; and Dante Gabriel Rosetti's Pandora realised £2,643,750, a record for any British work on art on paper. Jonathan Horwich, head of the British and Irish Arts department at Christie's, said after the auction that the St Cecilia was a magnificent painting that had fetched a magnificent price. "This work is the most important Victorian painting ever sold. It is a stunning price. It remains a picture of great originality. It could never be mistaken for the work of anyone but Waterhouse."